Your body’s internal communication system is amazing. When something is wrong, your nervous system lets your brain know so you can address the problem. An example of how impressive this system is can be seen with stress fractures. These are tiny cracks inside your body, yet your nerves are still able to say, “Hey, something’s wrong here!” Your body knows that even a seemingly small matter like a stress fracture is actually a rather big deal. Your skeletal system is comprised of your body’s least flexible tissue – your bones. The fact that these structural components are solid is essential for giving you shape, but it means that they are prone to breaking instead of bending. This breaking happens in various degrees. You can sustain a displaced fracture, where your bone has snapped into two or more parts, or a stress fracture, which is a hairline bone crack. Whereas displaced or simple fractures stem from traumatic force - like a car accident or dropping a heavy weight on your foot - stress fractures are more likely to develop over time. It is possible to develop a stress fracture in any bone, but these cracks are often found in your lower limbs and appendages. The primary symptom of a stress fracture is the pain you experience in a specific location that increases in intensity with activity and becomes more bearable with rest. In addition to the pain, you can expect to feel tenderness and also experience swelling in the area. If this describes your current condition, come in to our office so we can provide an accurate diagnosis. The central cause of a stress fracture is repetitive application of force greater than the amount your feet and legs are accustomed to bearing. This leads to an imbalance in the natural process of resorption and growth of bone tissue, which both happen constantly in your bones. When you face additional force, your body has to resorb bone cells at a faster rate than they can be replaced. Since your bones are weakened, tiny cracks develop and ultimately become stress fractures. In part, a risk factor of sustaining a stress fracture is simply being human. The average person will have two broken bones during the course of his or her lifetime. Other risk factors include performing lots of high-impact physical activity like running, football, and gymnastics. Beyond simply being active, you are at greater risk if you progress from a sedentary lifestyle to one that is highly active in a short time. Physical conditions like flatfeet, high arches, and osteoporosis also increase the chances of sustaining a stress fracture. Treating a stress fracture essentially comes down to resting, keeping bodyweight off the affected limb, icing the area, and resuming activity slowly. The goals are to ensure that the stress fracture heals correctly, does not become worse due to activity, and that your pain is properly managed. Our practice will help you with all of this with an effective treatment plan. 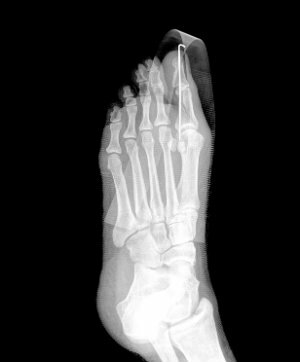 Given that many stress fractures are the result of a sudden start or increase in activity levels, a major prevention technique is to begin any workout program at a low level and gradually progress with regards to duration, intensity and frequency. Keeping in the spirit of exercise, it is also important for you to cross-train by incorporating low-impact activities—swimming, bicycling, yoga—into your workout routine. Proper nutrition and footwear also play a role in preventing a stress fracture. Your bones need the correct nutrients (particularly calcium and vitamin D) in order to be strong and healthy. Include foods like low-fat dairy products and veggies into your daily diet. With regard to footwear, choose shoes that fit well and offer adequate arch support and cushioning, especially if you run often. Don’t let stress fractures develop into larger problems! Get the help you need at Southern Oregon Foot & Ankle, from our caring, professional staff. We have the expertise to address any foot or ankle issue you may be experiencing at our Medford, OR office. Call us at (541) 776-3338 or use our online form to schedule an appointment today. ?How can I avoid shin splints? ?Do I need surgery for a stress fracture in my foot?